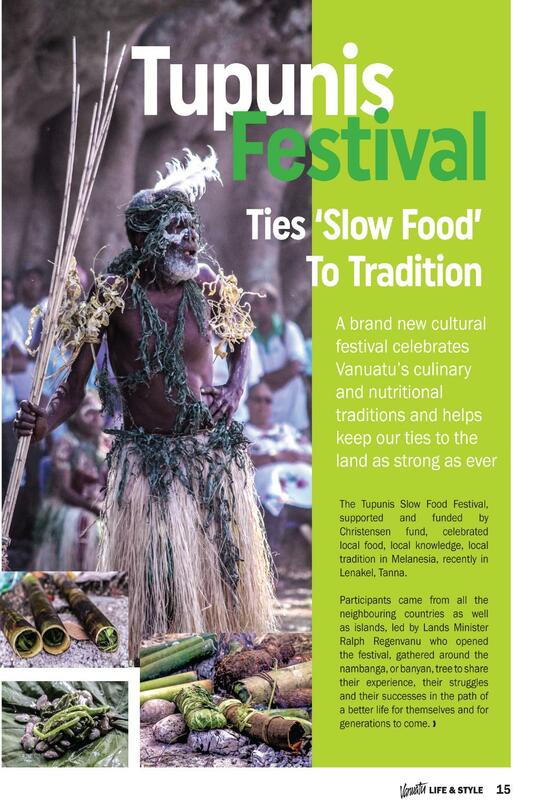 Just over a week ago the Tupunis Slow Food Festival on Tanna island, Vanuatu concluded. 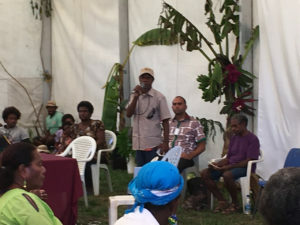 It was the first festival of its kind held in Melanesia – bringing together people from Vanuatu, Papua New Guinea, Bougainville, New Caledonia (Kanaky); the Solomon islands and Fiji to celebrate traditional ways of producing and preparing food as part of a redefinition of “development”; rejecting the simple monetary definitions (dollars per day) and exploitative, extractive industries that characterise what global institutions such as the World Bank and the IMF define as development in favour of alternative criteria that recognise the value of sustainable land and sea tenure, the qualities of organic grown food and traditional methods of preparation, and the richness of lives not governed by the need for money. The festival was organised by a coalition of local organisations (including Vanuatu Slow Food Network, Vanuatu Land Defence Desk, Vanuatu Cultural Centre, Tafea Cultural Centre) and supported by The Christensen Fund as well as the Vanuatu Government. As part of our TK Reite Notebooks project, James Leach and I travelled to participate in the festival along with three people from Reite village in Papua New Guinea – Porer Nombo, Pinbin Sisau and Urufaf Anip – with whom we have been co-designing the TKRN toolkit since 2012. 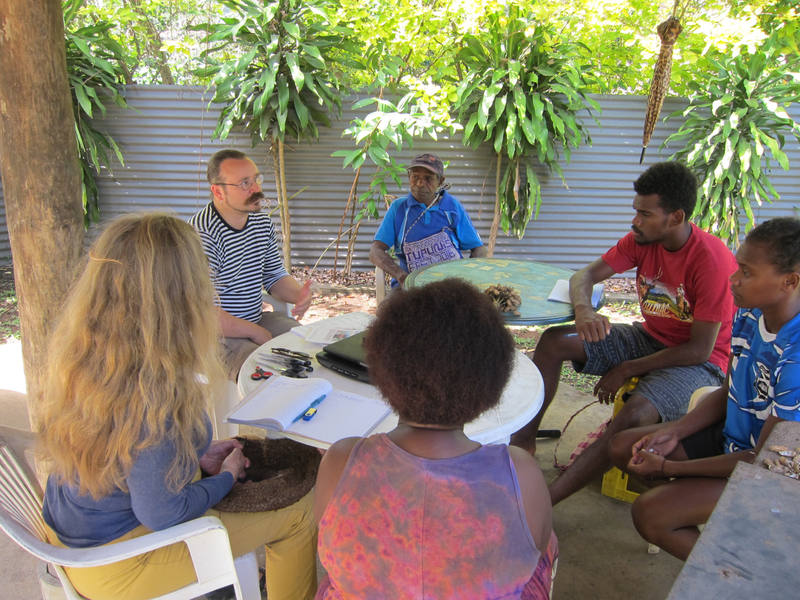 Our trip was intended to bring the TKRN project and toolkit to a wider audience of Melanesians interested in documenting and preserving traditional culture – with the focus on presentation being led by Reite people themselves (rather than James and myself). Our role was to facilitate and support, with the key exchange of ideas, tools and processes taking place between people indigenous to Melanesia themselves. This is a key aspect of the project for us – having our co-design collaborators from Reite village be identified and engaged with as cultural leaders in their own right who are actively taking steps to document and transmit their living culture and knowledge traditions to future generations in the face of extreme pressure from “development”. For most of our time we were also accompanied by Yat Paol, a PNG man of the Gildipasi community with whom we worked in Tokain village earlier this year (and a representative of The Christensen Fund in PNG). Yat’s insight and gentle wisdom concerning the importance of self-documentation of traditional knowledge as a means for indigenous people to empower themselves has been a source of inspiration and a great sounding board for us. 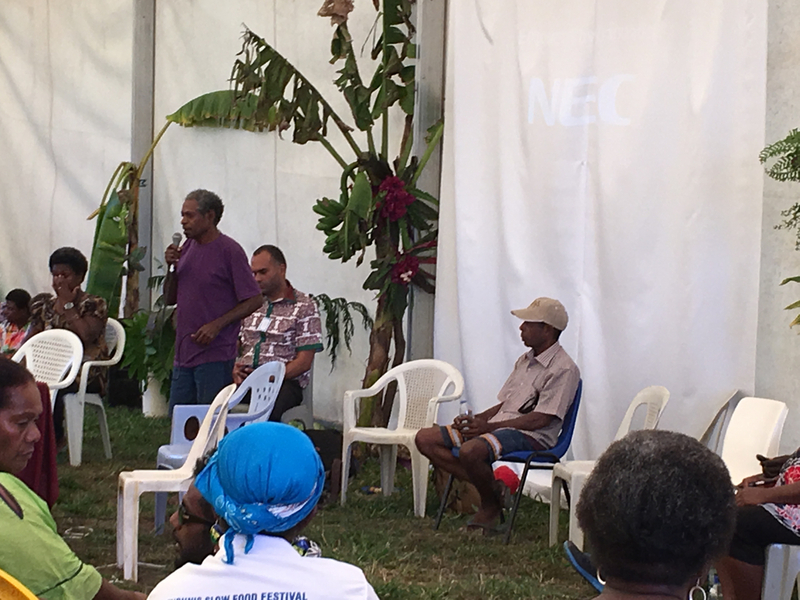 Porer and Pinbin represented Reite on a panel bringing perspectives from various Melanesian communities and spoke about the project and the importance of kastom, land and bush. For many people at the festival the emphasis was on a return to traditional ways of life – having two people who come from a community that maintains its traditional way of life speak about what it means to them and their families truly caught the mood of the audience and their response was fantastic, giving rousing applause. The festival ran over 5 days and had speakers from across the region, as well as performances by cultural groups, traditional crafts, music and demonstrations of new ideas for food preservation and health initiatives. Moreover, each day traditional foods were prepared and cooked by people from all the provinces and islands of Vanuatu (and New Caledonia) for attendees to sample. Thus we were feasted on a daily basis on everything from (and often in locally specific combinations of) taro, yam, manioc, tapioca, cassava, banana to fish, coconut crab, goat and beef. The Vanuatu Daily Post’s Life & Style section has an article on the festival here, and Sista.com has an article with excellent photos from the festival here. 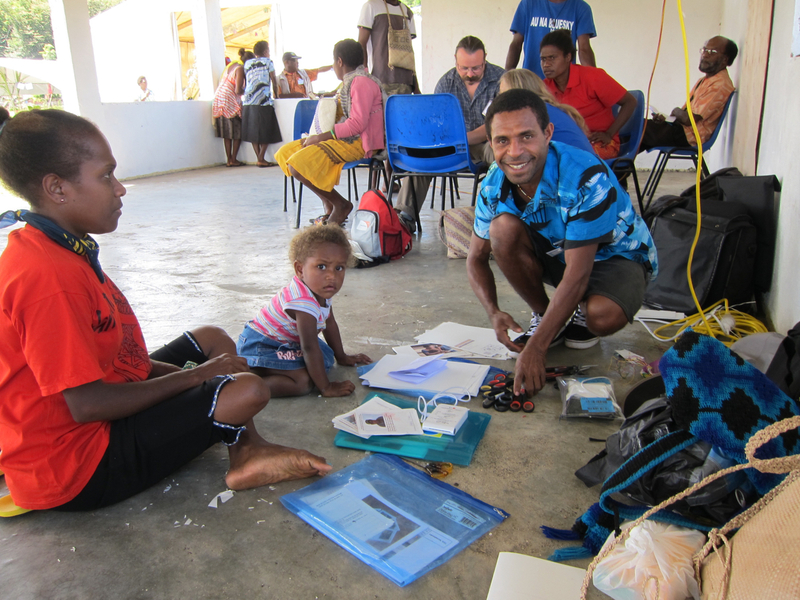 Once back in Port Vila, Jean also arranged for us to train a couple of young people who will be sharing their skills with the men fieldworkers of the Vanuatu Cultural Centre at the annual fieldworkers’ meeting at the end of September. 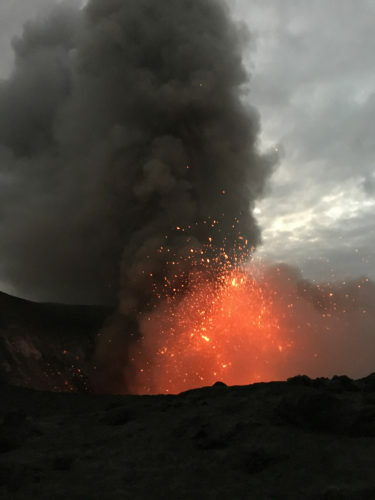 This will complement the work we did in March with the women fieldworkers and hopefully bring the TKRN toolkit to many different communities across Vanuatu. At the festival we also met and had great conversations with Dr Ruth Spriggs and Theonila Roka-Matbob from Bougainville (a semi-autonomous part of PNG), who are setting up an Indigenous Research Centre on the island, and Professor John Waiko of Oro Province PNG and his son, filmmaker and slow food activist Bao Waiko, from Markham Valley PNG (where he lives with his wife, Jennifer Baing-Waiko, also co-director of Save PNG). We’re hoping to share the TKRN toolkit with their initiatives as part of our next steps. Before attending the Tupunis festival, we took the opportunity to build on a relationship we had initiated with Wan Smolbag Theatre during our previous trip to Vanuatu earlier this year. Through co-founder Jo Dorras we were introduced to researcher Ben Kaurua and digital trainer Cobi Smith with whom we ran a TKRN workshop introducing the books and documentation process to a group of young volunteers who work with various island communities living in and around Port Vila, the capital on Efate island. (I had designed a very simple custom notebook for WSB in advance of travelling). We were also introduced to some local Chiefs from the nearby Lali community and were invited to attend a ceremony that was part of a boys’ initiation ritual. We left WSB with some new equipment to assist them in using the TKRN toolkit (a Polaroid Snap camera/printer & Zink sheet packs, as well as a low cost Canon combined inkjet scanner and printer) and are hoping to see some results in the future. After the festival, while I returned to the UK and Pinbin and Uru returned to Madang, James and Porer continued on their travels to participate in the IUCN World Conservation Congress in Hawaii. There they took part in a session on indigenous documentation to demonstrate the TKRN process and toolkit, and to discuss the complex issues facing traditional communities who wish to preserve their culture and values and to transmit them to future generations. This trip was the final activity of our recent TKRN programme – we are now preparing a new programme of activities that aim to build a lasting legacy for the project and enable the establishment of a network of indigenous groups and local organisations in Melanesia to adopt and adapt the TKRN toolkit for themselves. Huge thanks are owed to Catherine Sparks of The Christensen Fund who made so much of this possible; funding many of the projects, organisations and the festival itself, as well as being the consummate connector introducing people and taking care so that everyone had the most productive time possible. 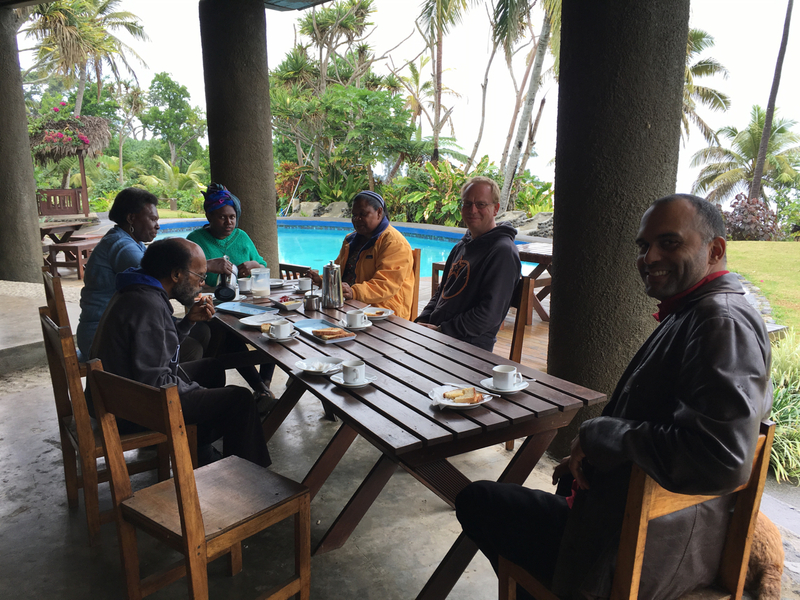 Thanks also go out to Paula Aruhuri, Joel Simo and Jacob Kapere who were instrumental in inviting us, arranging travel and accommodation and making time and space for us on the programme.